For a chronological list of human spaceflights, including crews, dates and mission summaries, see List of human spaceflights. Programs in this section are sorted by the years when the first successful crewed spaceflight took place. The Vostok program was a project that succeeded in putting a person into orbit for the first time. Sergei Korolev and Konstantin Feoktistov began, in June 1956, manned spacecraft research. The program developed the Vostok spacecraft from the Zenit spy satellite project and adapted the Vostok rocket from an existing ICBM design. Just before the first release of the name Vostok to the press, it was a classified word. By August/September 1958 a division had been formed devoted to producing the first Vostok craft. The official approval (decree) for the Vostok was delayed until 22 May 1959 by competition with photo reconnaissance programs. Vostok 1 was the first human spaceflight. The Vostok 3KA spacecraft was launched on April 12, 1961, taking into space Yuri Gagarin, a cosmonaut from the Soviet Union. The Vostok 1 mission was the first time anyone had journeyed into outer space and the first time anyone had entered into orbit. There were six Vostok flights in total. Another seven Vostok flights (Vostok 7 to 13) were originally planned, going through to April 1966, but these were canceled and the components recycled into the Voskhod program, which was intended to achieve more Soviet firsts in space. Project Mercury was the first human spaceflight program of the United States. It ran from 1959 through 1963 with the goal of putting a human in orbit around the Earth. The Mercury-Atlas 6 flight on 20 February 1962 was the first Mercury flight to achieve this goal. Early planning and research was carried out by the National Advisory Committee for Aeronautics, and the program was officially conducted by the newly created NASA. Because of their small size it was said that the Mercury spacecraft capsules were worn, not ridden. With 1.7 cubic meters of habitable volume, the capsule was just large enough for the single crew member. Inside were 120 controls: 55 electrical switches, 30 fuses and 35 mechanical levers. The spacecraft was designed by Max Faget and NASA's Space Task Group. NASA ordered 20 production spacecraft, numbered 1 through 20, from McDonnell Aircraft Company, St. Louis, Missouri. Five of the twenty spacecraft, #10, 12, 15, 17, and 19, were not flown. Spacecraft #3 and #4 were destroyed during unmanned test flights. Spacecraft #11 sank and was recovered from the bottom of the Atlantic Ocean after 38 years. Some spacecraft were modified after initial production (refurbished after launch abort, modified for longer missions, etc.) and received a letter designation after their number, examples 2A, 15B. Some spacecraft were modified twice; for example, spacecraft 15 became 15A and then 15B. The North American X-15 rocket-powered aircraft was part of the X-series of experimental aircraft, initiated with the Bell X-1, that were made for the USAF, NASA, and the USN. The X-15 set speed and altitude records in the early 1960s, reaching the edge of outer space and returning with valuable data used in aircraft and spacecraft design. It currently holds the world record for the fastest speed ever reached by a manned aircraft. During the X-15 program, 13 of the flights (by eight pilots) met the USAF spaceflight criteria by exceeding the altitude of 50 miles (80.47 km. 264,000 ft.), thus qualifying the pilots for astronaut status; some pilots also qualified for NASA astronaut wings. The Voskhod program (Russian: Восход, "ascent", "dawn") was a Soviet human spaceflight project. Voskhod development was both a follow-on to the Vostok program, recycling components left over from that program's cancellation following its first six flights. The two missions flown used the Voskhod spacecraft and rocket. The Voskhod spacecraft was basically a Vostok spacecraft that had a backup, solid fuel retrorocket added to the top of the descent module. The heavier weight of the craft was made possible by improvements to the R-7 Semyorka-derived booster. The ejection seat was removed and two or three crew couches were added to the interior at a 90-degree angle to that of the Vostok crew position. However, the position of the in-flight controls was not changed, so the crew had to crane their heads 90 degrees to see the instruments. While the Vostok program was dedicated more towards understanding the effects of space travel and microgravity on the human body, Voskhod's two flights were more aimed towards spectacular "firsts". Although achieving the first EVA ("spacewalk") became the main success of the program, beating the U.S. Gemini project to put the first multi-person crew in orbit was the objective that initially motivated the program. Once both goals were realized, the program was abandoned. This followed the change in Soviet leadership, which was less concerned about stunt and prestige flights, and allowed the Soviet designers to concentrate on the Soyuz program. Project Gemini was the second human spaceflight program of the National Aeronautics and Space Administration. It operated between Projects Mercury and Apollo, with 10 manned flights occurring in 1965 and 1966. 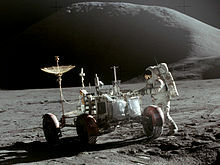 Its objective was to develop techniques for advanced space travel, notably those necessary for Project Apollo, whose objective was to land humans on the Moon. Gemini missions included the first American extravehicular activity, and new orbital maneuvers including rendezvous and docking. Gemini was originally seen as a simple extrapolation of the Mercury program, and thus early on was called Mercury Mark II. The actual program had little in common with Mercury and was superior to even Apollo in some ways. This was mainly a result of its late start date, which allowed it to benefit from much that had been learned during the early stages of the Apollo project (which, despite its later launch dates, was actually begun before Gemini). The Soyuz program (Russian: Союз, pronounced [sɐˈjus], meaning "Union") is a human spaceflight program that was initiated by the Soviet Union in early 1967. It was originally part of a Moon landing program intended to put a Soviet cosmonaut on the Moon. All experimental or unsuccessful starts received the status of satellites of a series Kosmos, and flights of the Lunar orbital ships around the Moon – the name Zond. Both the Soyuz spacecraft and the Soyuz rocket are part of this program, which is now the responsibility of the Russian Federal Space Agency. The basic Soyuz spacecraft design was the basis for many projects, many of which never came to light. Its earliest form was intended to travel to the moon without employing a huge booster like the Saturn V or the Soviet N-1 by repeatedly docking with upper stages that had been put in orbit using the same rocket as the Soyuz. This and the initial civilian designs were done under the Soviet Chief Designer Sergei Pavlovich Korolev, who did not live to see the craft take flight. Several military derivatives actually took precedence in the Soviet design process, though they never came to pass. The launch vehicles used in the Soyuz expendable launch system are manufactured at the Progress State Research and Production Rocket Space Center (TsSKB-Progress) in Samara, Russia. As well as being used in the Soyuz program as the launcher for the crewed Soyuz spacecraft, Soyuz launch vehicles are now also used to launch robotic Progress supply spacecraft to the International Space Station and commercial launches marketed and operated by TsSKB-Progress and the Starsem company. There were 11 Soyuz launches in 2001 and 9 in 2002. Currently, Soyuz vehicles are launched from the Baikonur Cosmodrome in Kazakhstan and the Plesetsk Cosmodrome in northwest Russia. Since 2009 Soyuz launch vehicles are also being launched from the Guiana Space Centre in French Guiana. The Apollo Program was undertaken by NASA during the years 1961–1975 with the goal of conducting manned Moon landing missions. In 1961, President John F. Kennedy announced a goal of landing a man on the moon by the end of the decade. It was accomplished on July 20, 1969, by the landing of astronauts Neil Armstrong and Buzz Aldrin, with Michael Collins orbiting above during the Apollo 11 mission. Five other Apollo missions also landed astronauts on the Moon, the last one in 1972. These six Apollo spaceflights are the only times humans have landed on another celestial body. 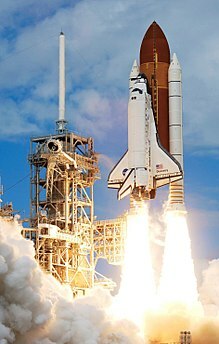 NASA's Space Shuttle, officially called "Space Transportation System" (STS), is the United States government's most recent crewed launch vehicle and was retired from service in 2011. The winged Space Shuttle orbiter was launched vertically, usually carrying five to seven astronauts (although eight have been carried) and up to 50,000 lb (22 700 kg) of payload into low earth orbit. When its mission is complete, the shuttle can independently move itself out of orbit (by means of making a 180-degree turn and firing its main engines, thus slowing it down) and re-enter the Earth's atmosphere. During descent and landing, the orbiter acts as a glider and makes a completely unpowered landing. The Shuttle is the only winged crewed spacecraft to achieve orbit and land, and the only reusable space vehicle that has ever made multiple flights into orbit. Its missions involve carrying large payloads to various orbits (including segments to be added to the International Space Station), providing crew rotation for the International Space Station, and performing service missions. The orbiter can also recover satellites and other payloads from orbit and return them to Earth, but its use in this capacity is rare. However, the shuttle has previously been used to return large payloads from the ISS to Earth, as the Russian Soyuz spacecraft has limited capacity for return payloads. Each vehicle was designed with a projected lifespan of 100 launches, or 10 years' operational life. The Shenzhou program (Chinese: 神舟; pinyin: Shén Zhōu) is a crewed spaceflight initiative by the People's Republic of China. The program put the first Chinese citizen into orbit on 15 October 2003. Development began in 1992, under the name of Project 921-1. The Chinese National Space Program was given the designation Project 921 with Project 921-1 as its first significant goal. The plan called for a crewed launch in October 1999, prior to the new millennium. The first four robotic test flights happened in 1999, 2001 and 2002. These were followed with three crewed launches in 2003, 2005, and 2008. Robotic and crewed launches to test docking occurred in 2011 and 2012 respectively. It is launched on the Long March 2F from the Jiuquan Satellite Launch Center. The command center of the mission is the Beijing Aerospace Command and Control Center. The name is variously translated as "Divine Craft", "Divine Vessel" or similar, but is also a reference to a literary name for China with the same pronunciation (神州; literally "Divine Land"). Virgin Galactic is a company within Sir Richard Branson's Virgin Group, which is developing a privately funded spacecraft called SpaceShipOne and SpaceShipTwo, in conjunction with Scaled Composites to offer sub-orbital spaceflights and later orbital spaceflights to the paying public. SpaceShipOne reached space with a pilot in three test flights in 2004. 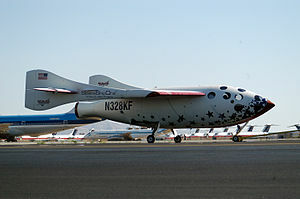 Tier One is Scaled Composites' program of suborbital human spaceflight using the reusable spacecraft SpaceShipOne and its launcher White Knight. The craft are designed by Burt Rutan, and the project is funded 20 million US Dollars by Paul Allen. In 2004 it made the first privately funded human spaceflight and won the 10 million US Dollars Ansari X Prize for the first non-governmental reusable crewed spacecraft. The objective of the project is to develop technology for low-cost routine access to space. Tier One is not itself intended to carry paying passengers, but it is envisioned that there will be commercial spinoffs, initially in space tourism. The company Mojave Aerospace Ventures was formed to manage commercial exploitation of the technology. A deal with Virgin Galactic could see routine space tourism, using a spacecraft based on Tier One technology. The model finally developed into SpaceShipTwo, Virgin Galactic's second generation suborbital vehicle. On 10 October 2010, VSS Enterprise, the first SpaceShipTwo spaceplane, made its first crewed gliding test flight. By October 2014 SpaceShipTwo had conducted 54 test flights. On October 31, 2014, SpaceShipTwo VSS Enterprise suffered an in-flight breakup during a powered flight test, resulting in a crash killing one pilot and injuring the other. The second SpaceShipTwo, VSS Unity, made first flight tests in 2016. The Salyut program was the first space station program undertaken by the Soviet Union, which consisted of a series of four crewed scientific research space stations and two crewed military reconnaissance space stations over a period of 15 years from 1971 to 1986. Two other Salyut launches failed. Salyut was, on the one hand, designed to carry out long-term research into the problems of living in space and a variety of astronomical, biological and Earth-resources experiments, and on the other hand this civilian program was used as a cover for the highly secretive military Almaz stations, which flew under the Salyut designation. Salyut 1, the first station in the program, became the world's first crewed space station. Salyut broke several spaceflight records, including several mission duration records, the first ever orbital handover of a space station from one crew to another, and various spacewalk records. 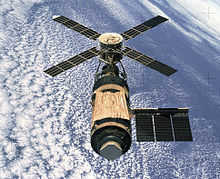 Skylab was launched and operated by NASA and was the United States' first space station. Skylab orbited Earth from 1973 to 1979, and included a workshop, a solar observatory, and other systems. It was launched uncrewed by a modified Saturn V rocket, with a weight of 169,950 pounds (77 t). Three crewed missions to the station, conducted between 1973 and 1974 using the Apollo Command/Service Module (CSM) atop the smaller Saturn IB, each delivered a three-astronaut crew. On the last two crewed missions, an additional Apollo / Saturn IB stood by ready to rescue the crew in orbit if it was needed. Mir was the first modular space station and was assembled in orbit from 1986 to 1996. It had a greater mass than any previous spacecraft. Until 21 March 2001 it was the largest artificial satellite in orbit, succeeded by the International Space Station after Mir's orbit decayed. The station served as a microgravity research laboratory in which crews conducted experiments in biology, human biology, physics, astronomy, meteorology and spacecraft systems with a goal of developing technologies required for permanent occupation of space. 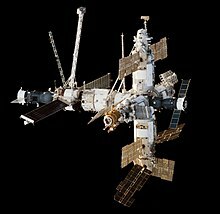 Mir was the first continuously inhabited long-term research station in orbit and set the record for the longest continuous human presence in space at 3,644 days until 23 October 2010 when it was surpassed by the ISS. It holds the record for the longest single human spaceflight, with Valeri Polyakov spending 437 days and 18 hours on the station between 1994 and 1995. Mir was occupied for a total of twelve and a half years out of its fifteen-year lifespan, having the capacity to support a resident crew of three, or larger crews for short term visits. Mir had 28 long duration crews. The International Space Station (ISS) is a space station in low Earth orbit. Its first component launched into orbit in 1998, and the ISS is now the largest artificial body in orbit and can often be seen with the naked eye from Earth. The ISS consists of pressurized modules, external trusses, solar arrays and other components. ISS components have been launched by Russian Proton and Soyuz rockets as well as American Space Shuttles. The ISS program is a joint project among five participating space agencies: NASA, Roscosmos, JAXA, ESA, and CSA. The ownership and use of the space station is established by intergovernmental treaties and agreements. The station is divided into two sections, the Russian Orbital Segment (ROS) and the United States Orbital Segment (USOS), which is shared by many nations. The American portion of ISS was funded until 2024. Roscosmos has also endorsed the continued operation of ISS through 2024, but have proposed subsequently using elements of the Russian Orbital Segment to construct a new Russian space station called OPSEK. Tiangong 1 2012–2013 – Spacelab and docking testbed. Visited by 2 crews. De-orbited by 2 April 2018. Tiangong-2 launched on 15 September 2016, 22:04:09 (UTC+8). Visited by 1 crew. Programs in this section are sorted by the years when their development started. The Dream Chaser was originally intended to serve as an American reusable crewed suborbital and orbital lifting-body spaceplane being developed and privately funded by Sierra Nevada Corporation (SNC) Space Systems. It is now planned to be a robotic cargo transport to the ISS. The Dream Chaser was designed to carry up to seven people to and from low Earth orbit prior to the decision to transition to a robotic platform. The vehicle would launch vertically on an Atlas V rocket and land horizontally on conventional runways. On 26 October 2013, the first glide flight occurred. An initial orbital test flight of the Dream Chaser orbital test vehicle was planned for 1 November 2016,  which was not met. On 3 February 2015, the Sierra Nevada Corporation's (SNC) Space Systems and OHB System AG (OHB) in Germany announced the completion of the initial Dream Chaser for European Utilization (DC4EU) study. As of January 2019, the first orbital flight of the robotic Dream Chaser is planned for 2020. The New Shepard is a reusable launch system capable of vertical-takeoff, vertical-landing (VTVL), suborbital crewed spacecraft that is being developed by Blue Origin, a company owned by Amazon.com founder and businessman Jeff Bezos, as a commercial system for suborbital space tourism. The New Shepard makes reference to the first United States astronaut in space, Alan Shepard. The first flight of the New Shepard vehicle was conducted on 29 April 2015 during which an altitude of 93,500 meters (307,000 ft) was attained. While the test itself was deemed a success and the capsule was correctly recovered via parachute landing, the booster stage landing failed because hydraulic pressure was lost during the descent. Nine subsequent flights (through January 2019), including two in-flight abort tests, took place with safe landings of both capsule and booster. Crewed test flights are expected in 2019. The Indian Human Spaceflight Programme (HSP) manages the crewed space flight project for the Indian Space Research Organisation (ISRO) to develop and launch a crewed spacecraft named Gaganyaan to low Earth orbit in December 2021. HEAT 1X Tycho Brahe was the first rocket and spacecraft combination built by Copenhagen Suborbitals, a Danish organization attempting to perform the first amateur suborbital crewed spaceflight. The vehicle consisted of a motor named HEAT-1X and a spacecraft Tycho Brahe. Formerly called PPTS (Prospective Piloted Transport System), Federation (Russian: Федерация, Federatsiya) is a new multi-task Russian spacecraft for LEO, ISS and lunar missions. The spacecraft, when revealed in 2015, resembled NASA's Orion capsule and had a set of soft-landing type legs similar to the SpaceX Dragon 2 spacecraft. It is scheduled for a first flight in 2021. The Space Launch System (SLS) is an American Space Shuttle-derived heavy expendable launch vehicle being developed by NASA. It follows the cancellation of the Constellation program, and is to replace the retired Space Shuttle. The NASA Authorization Act of 2010 envisions the transformation of the Constellation program's Ares I and Ares V vehicle designs into a single launch vehicle usable for both crew and cargo, similar to the Ares IV. SLS will be the world's most powerful rocket with 20% more thrust than Saturn V and a comparable payload capacity. The SLS launch vehicle is to be upgraded over time with more powerful versions. Its initial Block 1 version is to lift a payload of 70 metric tons to low Earth orbit (LEO), which will be increased with the debut of Block 1B and the Exploration Upper Stage. Block 2 will replace the initial Shuttle-derived boosters with advanced boosters and is planned to have an LEO capability of more than 130 metric tons to meet the congressional requirement. These upgrades will allow the SLS to lift astronauts and hardware to various beyond-LEO destinations: on a circumlunar trajectory as part of Exploration Mission 1 with Block 1, to a lunar flyby in Exploration Mission 2 with Block 1B, and to Mars with Block 2. The SLS will launch the Orion Crew and Service Module and may support trips to the International Space Station if necessary. SLS will use the ground operations and launch facilities at NASA's Kennedy Space Center, Florida. The first uncrewed test flight is scheduled for June 2020. The Commercial Crew Development is an economic stimulus program funds technology development related to human spaceflight by private companies. In September 2014 NASA awarded contracts to SpaceX and Boeing to build crewed spacecraft for low Earth orbit operations. The SpaceX Dragon 2 is a development of the robotic Dragon cargo spacecraft which has been re-supplying the International Space Station since 2010. The spacecraft will be able to carry a crew of up to seven astronauts to the International Space Station. It includes a set of four side-mounted thruster pods with two SuperDraco engines each as Launch Abort System (LAS). To develop Dragon 2, SpaceX did a "pad abort" test in May 2015. An uncrewed orbital flight to the ISS occurred in March 2019, where the Dragon flew on a one-week mission to space, docked to the ISS and then splashed down in the Atlantic Ocean, an in-flight abort test is planned a few months later and a crewed demonstration mission to the ISS is planned for July 2019. The CST-100 Starliner (Crew Space Transportation) crew capsule is a spacecraft design under construction by Boeing in collaboration with Bigelow Aerospace for NASA's Commercial Crew Development (CCDev) program. Its primary mission is to transport crew to the International Space Station, and to private space stations such as the proposed Bigelow Aerospace Commercial Space Station. The Starliner is to support larger crews of up to seven people. The CST-100 is designed to be able to remain on-orbit for up to seven months and for reusability for up to ten missions. Boeing's CST-100 Starliner is scheduled to perform an uncrewed test flight to ISS in early 2019,[needs update] and its first crewed demonstration flight in mid-2019. New Glenn is an orbital launch vehicle under development by Blue Origin. The company expects a first flight before 2020. Like New Shepard, the first stage is designed to land vertically to be reusable. It can launch either a cargo or a crew capsule to space. The BFR is a fully reusable two-stage launch system under development by SpaceX. The lower stage is called Superheavy and the crewed upper stage is called Starship. Both stages are designed for vertical landings and frequent reuse. It will replace the operational Falcon 9 and Falcon Heavy rockets. First hops and suborbital tests have been announced for 2019, orbital flights are planned around 2021. With in-orbit refueling and in-situ propellant production on Mars the spacecraft is expected to be able to transport humans to the surface of Moon and to Mars. The Iranian manned spaceship project is a proposal by the Iranian Aerospace Research Institute of Iranian Space Research Center (ISRC) to put an astronaut into space. The details of the design were published by the institute in its "Astronaut" publication in February 2015. A mock up of the spaceship was displayed on 17 February 2015 during the ceremony of the national day of space of Iran. The head of the institute announced that the spaceship will be launched to space in about a year. [needs update] The spaceship is supposed be able to carry a single astronaut to a 175 km height and return him to the Earth. The spaceship is designed under the code name "Class E Kavoshgar" project. As of March 2019, no launch has happened. The Orbital Piloted Assembly and Experiment Complex (abbreviated OPSEK) is a proposed third-generation modular space station in Low Earth orbit. OPSEK would initially consist of modules from the Russian Orbital Segment of the International Space Station (ISS) from 2024. Bigelow Commercial Space Station (USA): A Bigelow inflatable module was attached to the ISS on April 8, 2016, where it will remain for a testing period of two years. Any independent Bigelow Commercial space station will have to await the development of commercially available human rated orbital spacecraft. The first of these are expected to be the SpaceX Dragon 2 and the Boeing CST-100 Starliner in 2019. Man In Space Soonest was a United States Air Force program to put an American astronaut in orbit. It was canceled when NASA was formed in August 1958. The X-20 Dyna-Soar (Dynamic Soarer) was a United States Air Force program to develop a crewed spaceplane that could be used for a variety of military missions, including reconnaissance, bombing, space rescue, satellite maintenance, and sabotage of enemy satellites. The program ran from 24 October 1957 to 10 December 1963 and was canceled just after spacecraft construction had begun. The Manned Orbital Development System was a project by the Air Force Space System Division (SSD). It was to begin working on plans to use Gemini hardware as the first step in a new US Air Force man-in-space program called MODS (Manned Orbital Development System), a type of military space station that used Gemini spacecraft as ferry vehicles. MODS was effectively superseded when the Manned Orbital Laboratory was announced in December 1963. Western nickname "Battlestar Khrushchev" a nuclear-armed monolith station, about 5 times the volume of Salyut 1 and as heavy as Skylab. The station was designed for a crew of 6 and proceeded to mock-up stage before cancellation. The Manned Orbiting Laboratory (MOL) was part of the United States Air Force's manned spaceflight program, a successor to the canceled X-20 Dyna-Soar project. It was announced to the public on the same day that the Dyna-Soar program was canceled, 10 December 1963. the program was redirected in the mid-1960s and developed as a space station used for reconnaissance purposes. The space station used a spacecraft that was derived from NASA's Gemini program. The project was canceled on 10 June 1969 before there were any manned flights. In accordance with the quinquennial plan of the Soviet air forces, the Spiral program to develop a 2-stage launcher plane began in 1965 and was entrusted to OKB-155 A.I.Mikojan whose chief of the engineering and design department was Lozino Lozinsky (55 years). The project received the name of SPIRAL and was to prepare the Soviet Union for a war in space. The TKS spacecraft (Russian: Транспортный корабль снабжения, Transportnyi Korabl Snabzheniia, Transport Supply Spacecraft, GRAU index 11F72) was a Soviet spacecraft conceived in the late 1960s for resupply flights to the military Almaz space station. The spacecraft was designed for both crewed and autonomous uncrewed cargo resupply flights, but was never used operationally in its intended role – only four test missions were flown (including three that docked to Salyut space stations) during the program. The Functional Cargo Block (FGB) of the TKS spacecraft later formed the basis of several space station modules, including the Zarya FGB module on the International Space Station. The Soviet Buran program was a reusable spaceplane project begun in 1976 at TsAGI as a response to the United States Space Shuttle program. It had only one orbital flight, an uncrewed test, before cancellation. In the process it became the first spaceplane to land autonomously. The Shuguang program was the first Chinese crewed space program with plans to launch two astronauts by 1973. The Piloted FSW program was the second Chinese crewed space program based on the successful achievement of landing technology (third in the world after USSR and USA) by FSW satellites. The Saenger was a proposed two stage to orbit vehicle. Air-breathing hypersonic first stage and delta wing second stage. The German Hypersonics Program and its Saenger II reference vehicle received most of the domestic funding for spaceplane development in the late 1980s and early 1990s. In 1995, the project was discontinued primarily due to concerns of development costs and limited gains in price and performance compared to the existing space launch systems such as the Ariane 5 rocket. The Zarya spacecraft was a secret Soviet project of the late 1980s aiming to design and build a large, crewed, vertical takeoff, vertical landing (VTVL) reusable space capsule, a much larger replacement for the Soyuz (spacecraft). The project was shelved in 1989, shortly before the Soviet Union's collapse. The Rockwell X-30 was an advanced technology demonstrator project for the National Aero-Space Plane (NASP), part of a United States project to create a single-stage-to-orbit (SSTO) spacecraft and passenger spaceliner. See also List of X-planes. Hermes was a proposed spaceplane designed by the French Centre National d'Études Spatiales (CNES) in 1975, and later by the European Space Agency (ESA). It was superficially similar to the American Boeing X-20 Dyna-Soar and the larger Space Shuttle. The MAKS (Russian: МАКС (Многоцелевая авиационно-космическая система), Multipurpose aerospace system) was a Soviet air-launched reusable launch system project with orbiter that was proposed in 1988 but canceled in 1991. HOPE-X was a Japanese experimental spaceplane project designed by a partnership between NASDA and NAL (both now part of JAXA), started in the 1980s. It was positioned for most of its lifetime as one of the main Japanese contributions to the International Space Station, the other being the Japanese Experiment Module. The project was eventually canceled in 2003, by which point test flights of a sub-scale testbed had flown successfully. The Kankoh-maru (観光丸? Kankōmaru) is the name of a proposed vertical takeoff and landing (VTVL), single-stage-to-orbit (SSTO), reusable launch system (rocket-powered spacecraft). The Ansari X Prize was a space competition in which the X Prize Foundation offered a US$10,000,000 prize for the first non-government organization to launch a reusable crewed spacecraft into space twice within two weeks. Twenty-six teams from around the world participated, ranging from volunteer hobbyists to large corporate-backed operations. Won by Scaled Composites' Tier One project. The other companies stopped work or as ARCA Space Corporation switched to other, more immediate purposes. VentureStar was a single-stage-to-orbit reusable launch system proposed by Lockheed Martin and funded by the U.S. government. The goal was to replace the Space Shuttle by developing a reusable spaceplane that could launch satellites into orbit at a fraction of the cost. Fuji (ふじ) was a crewed spacecraft of the space capsule kind, proposed by Japan's National Space Development Agency (NASDA) Advanced Mission Research Center in December 2001. The Fuji design was ultimately not developed. Hopper was a proposed European Space Agency orbital and reusable launch vehicle. The shuttle prototype spaceplane was one of several proposals for a European reusable launch vehicle (RLV) planned to cheaply ferry satellites into orbit by 2015. There have been no launches. Kliper (Russian: Клипер, Clipper) was a partly reusable crewed spacecraft concept, proposed in the early 2000s by RSC Energia. Due to lack of funding from the ESA and RSA, the project was indefinitely postponed by 2006. Project Constellation, NASA's intended successor to the Space Shuttle, is a program to develop new crafts and respective delivery systems for increased operation in space. It is primarily intended to facilitate missions for International Space Station resupply, lunar landing, etc. The Constellation program was canceled in 2010 and replaced with the Space Launch System (SLS). The XCOR Lynx is a suborbital horizontal-takeoff, horizontal-landing (HTHL), rocket-powered spaceplane under development by the California-based company XCOR Aerospace to compete in the emerging suborbital spaceflight market. The Lynx is projected to carry one pilot, a ticketed passenger, and/or a payload above 100 km altitude. The Mark I test model will reach only 200,000 feet (61 km); the Mark II production model will be sub-orbital. According to a September 2015 report, the first flight of the Lynx spaceplane was proposed to be in the second quarter of 2016 from Midland, Texas, but the company halted spaceplane development in May 2016 and refocused on its LOX/H2 engine technology. ^ "Aerospaceweb.org | Aircraft Museum X-15". Aerospaceweb.org, 24 November 2008. ^ Jenkins, Dennis R. Space Shuttle: The History of the National Space Transportation System: The First 100 Missions, 3rd edition. Stillwater, Minnesota: Voyageur Press, 2001. ISBN 0-9633974-5-1. ^ "NASA astronaut wings award ceremony". NASA Press Release, 23 August 2005. ^ "The Spaceport's new Soyuz launch site is ready for installation of its mission equipment". Arianespace. October 3, 2008. Archived from the original on April 15, 2009. ^ 30th Anniversary of Apollo 11, Manned Apollo Missions, NASA, 1999. ^ Wall, Mike (8 October 2014). "Virgin Galactic's SpaceShipTwo Aces Glide Test Flight". Space.com. Retrieved 8 October 2014. ^ "SpaceShipTwo disaster: Industry mourns pilot but vows to keep ... - BakersfieldCalifornian.com". The Bakersfield Californian. Archived from the original on 2015-10-23. ^ "SpaceShipTwo 'Feather' Tail System Deployed Prematurely: NTSB". ^ "Update from Mojave: VSS Unity's First Flight Test Completed – Virgin Galactic". virgingalactic.com. 9 September 2016. Archived from the original on 12 September 2016. Retrieved 16 September 2016. ^ Jackman, Frank (29 October 2010). "ISS Passing Old Russian Mir In Crewed Time". Aviation Week. ^ John E. Catchpole (17 June 2008). The International Space Station: Building for the Future. Springer-Praxis. ISBN 978-0-387-78144-0. ^ Achenbach, Joel (8 January 2014). "NASA: International space station operation extended by Obama until at least 2024". washingtonpost.com. Retrieved 8 January 2014. ^ de Selding, Peter B. (25 February 2015). "Russia — and Its Modules — To Part Ways with ISS in 2024". Space News. Retrieved 26 February 2015. ^ Branigan, Tania; Sample, Ian (2011-04-26). "China unveils rival to International Space Station". The Guardian. London. Retrieved 2011-04-27. China often chooses poetic names for its space projects, such as Chang'e – after the moon goddess – for its lunar probes; its rocket series, however, is named Long March, in tribute to communist history. The space station project is currently referred to as Tiangong, or "heavenly palace". ^ Completion of the initial DC4EU study (2015-03-02). 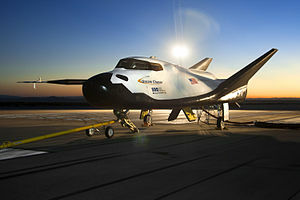 "http://www.sncorp.com/AboutUs/NewsDetails/749"
^ "Dream Chaser through critical landing test, prepares for orbital flights". nasaspaceflight.com. November 24, 2017. Retrieved January 28, 2019. ^ Bezos, Jeff (2015-04-27). "First Developmental Test Flight of New Shepard". Blue Origin. Archived from the original on 2015-04-30. Retrieved 27 April 2015. ^ Foust, Jeff (2015-04-30). "Blue Origin's New Shepard Vehicle Makes First Test Flight". Space News. Retrieved 1 May 2015. ^ "Russia reveals its next generation spacecraft set to launch in 2021". Mail Online. 28 August 2015. ^ "Most powerful rocket ever edges closer to lift-off". newatlas.com. ^ Spaceflight, Denise Chow 2011-09-14T20:06:26Z Human. "NASA's New Mega Rocket Would Be Most Powerful Ever Built". Space.com. ^ Gwynne Shotwell (2014-03-21). Broadcast 2212: Special Edition, interview with Gwynne Shotwell (audio file). The Space Show. Event occurs at 24:05–24:45 and 28:15–28:35. 2212. Archived from the original (mp3) on 2014-03-22. Retrieved 2014-03-22. we call it v2 for Dragon. That is the primary vehicle for crew, and we will retrofit it back to cargo. ^ "End Of Mission: SpaceX, NASA wrapping Crew Dragon's inaugural flight to Station – NASASpaceFlight.com". Retrieved 2019-03-08. ^ "Falcon Heavy and Starlink headline SpaceX's upcoming manifest – NASASpaceFlight.com". Retrieved 2019-03-08. ^ Memi, Edmund G.; Morgan, Adam K. (September 23, 2009). "Boeing Submits Proposal for NASA Commercial Crew Transport System" (Press release). Boeing. ^ "Orbital Complex Construction". Bigelow Aerospace. Archived from the original on July 10, 2010. Retrieved July 15, 2010. ^ "NASA's Commercial Crew Program Target Test Flight Dates". NASA. August 2, 2018. Retrieved August 16, 2018. ^ "Jeff Bezos plans to boost humans into space from Cape Canaveral". CBS News. 2015-09-15. Retrieved 2016-09-16. ^ "A review to the next generation manned spaceship of Iran" (PDF). February 2015. Archived from the original (PDF) on 8 October 2015. Retrieved 9 March 2015. ^ "Iran Unveils Mock-Up of Manned Spacecraft - Science news". Tasnim News Agency. ^ "Iran Unveils Mock-Up of Manned Spacecraft". 17 February 2015. Retrieved 9 March 2015. ^ "Iran displays manned spacecraft prototype". 18 February 2015. Archived from the original on 21 February 2015. Retrieved 9 March 2015. ^ "Russia 'to save its ISS modules'". BBC News. 2009-05-22. Retrieved 2009-07-04. ^ Spaceflight, Mike Wall 2015-08-18T12:11:30Z. "Inflatable Habitats: From the Space Station to the Moon and Mars?". Space.com. ^ In Race for Private Space Stations, It's U.S. Versus Russia, Space.com, 2010-11-12, accessed 2010-11-13. ^ "SPIRAL project Description". www.buran-energia.com. ^ "Краткая история создания "Бурана"". www.buran.ru. ^ "Saenger II". Encyclopedia Astronautica. Archived from the original on 5 August 2014. Retrieved 11 September 2014. ^ Zak, Anatoly (2009-04-29). "Russia mulls rocket power 'first'". BBC News. Retrieved 2011-10-11. RKK Energia, ... in the 1980s ... worked on a highly classified project to develop a large manned capsule, called Zarya ("Dawn"), for a wide range of civilian and military missions. ^ "MSDC president: Lynx will launch from Midland this fiscal year". Midland Reporter-Telegram. 8 September 2015. ^ Foust, Jeff (2016-05-31). "XCOR lays off employees to focus on engine development". SpaceNews. Retrieved 2016-07-13. has decided to focus the majority of its resources on the final development of the revolutionary liquid oxygen and liquid hydrogen (LH2) program. This innovative propulsion technology has applications to upper stage liquid hydrogen engines suitable for the Atlas V, Delta IV, and the planned NASA Space Launch System (SLS). ... XCOR's problem is — and has always been — funding. There wasn't enough of it to keep the Lynx staff. This page was last edited on 6 April 2019, at 07:11 (UTC).